What do you want to do for your planet? Meet Jennie and learn about her vision and passion to preserve wildlife and our planet. Visit our photo gallery on Facebook! Read about Jennie's experiences with wildlife, conservation and travel. 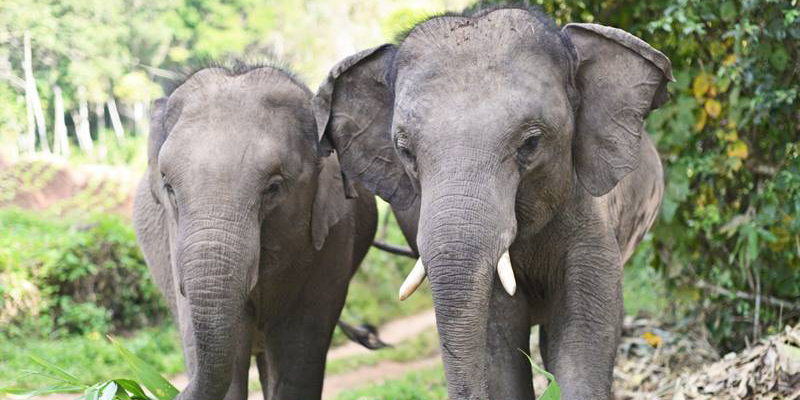 Spend a week in a tribal village where elephants roam freely! This project was set up to allow elephants owned by the Karen people to retire from trekking camps, logging, and exploitation and return to living in their villages. The project allows elephants to live a more natural life and restores the close connections that the Karen people traditionally have with their herd. Volunteers will stay at a home in the village. There they will learn about Karen tribal culture and watch elephants roam freely in this remote mountainous region. The project helps compensate the tribe for the income they would have received from leasing their elephants to tourist camps, in the hopes that the interest and affection shown toward elephants will spark a similar drive amongst the younger generations of tribespeople. The project also helps the local school, where volunteers teach English, plant the elephants’ food, build elephant shelters, and help construct facilities for the community. This community project, run in cooperation with the Karen people, provides an economic boost to the villages and benefits the entire community. By participating in this project, you will help elephants live freely in their home lands and improve local community living standards by building clean village toilets, water tanks, running water pipe systems, bridges, temples and schools. Another goal of the project is to show the Karen people a way of living that doesn’t involve the exploitation of their animals. We will develop and improve animal welfare in the village; help them to improve hygiene and care for their domestic animals (such as pigs, buffaloes, and cows), and provide animal vaccinations and medical care. We'll work together with the local community; volunteers help with working in the rice fields, temples and schools to improve develop and pass on skills. We will also aid the forest and wildlife in the area by replanting and performing other conservation work. You'll also get plenty of time with the elephants while walking them through the forest and feeding them! This community-based project will provide unique, memorable and authentic experiences. Supporting local cultural efforts takes travelers well beyond the traditional routes and provides a life-changing experience for participating volunteers. You'll fly into Chiang Mai, where you'll be picked up at the airport and transported to your accommodations. You'll have a couple of days to sightsee around Chiang Mai and get over jet lag! (Or you can book a tour from a local travel agency.) On Monday morning you'll be picked up at your hotel and taken to the highest mountain in Thailand for lunch. That afternoon you'll arrive at the village and will be taken further into the tribal town. You'll be welcomed with an evening ceremony by the Karen tribe who come to bless volunteers after dinner. You'll spend about a week in this village, minus the last night, which you'll spend at the project’s elephant sanctuary. There you'll be able to meet all kinds of rescued elephants that have been saved from exploitation in Thailand, and you'll enjoy a buffet dinner with other international volunteers. You'll return to Chiang Mai the following day, and spend one more night there. The following day you'll be taken to the airport for your flight home. Breakfast is at 7:00 am and dinner is at 6:00 pm daily (lunch is also included). 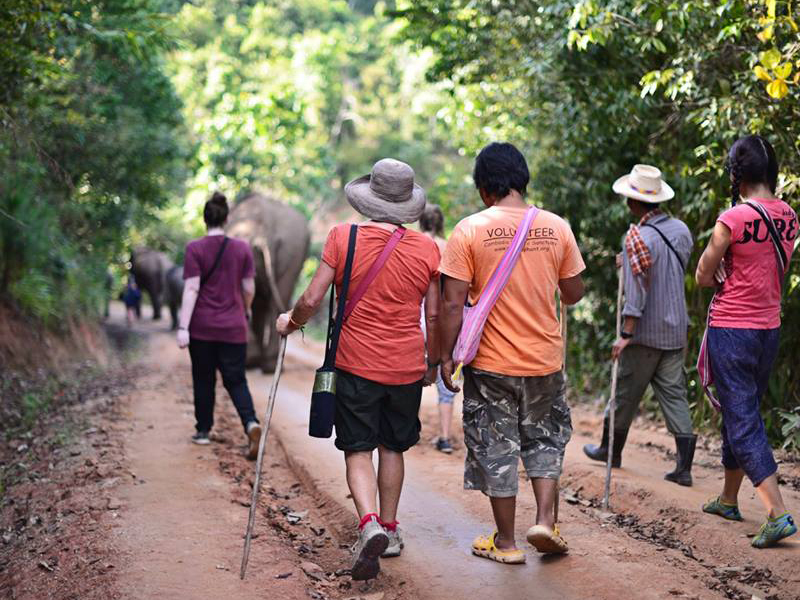 Some of your volunteer duties will include walking to the forest to search for elephants and bringing them to the village for vet checkups; cutting grass and gathering food for the elephants; assisting the vet in treating and feeding the elephants, and checking up on other animals such as dogs, cats, cows and buffaloes. You'll also be working with local temples and schools, learning about herbs used by the Karen tribe, saving the forest by replanting elephant food, and teaching English to the village children. One day before the project ends, you will be taken to the project’s elephant sanctuary to meet the herd of rescued elephants and hear their stories. On Sunday you will have breakfast at the park and will have the opportunity to spend time with the herd there, up close and personal. After lunch you will be driven back to the city of Chiang Mai. By participating in this project, you come away with the experience of personally helping a community. You will receive fascinating insight into the natural life of elephants as well as traditional tribal life. You will have plenty of time to spend with the elephants, and you'll help future generations enjoy this experience as well. 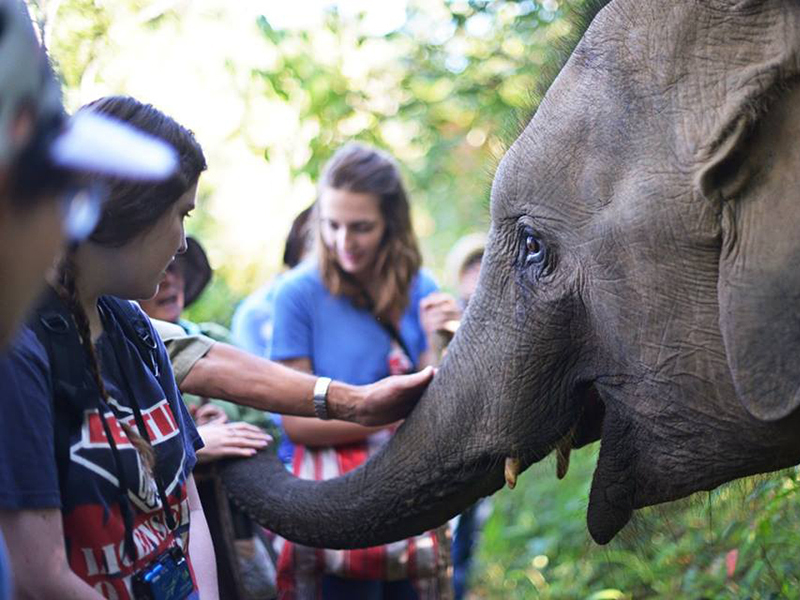 You will also come away with a real understanding of the issues facing elephants, meet people from around the world, and make friends in one of the world’s most beautiful countries. You will be staying with a Karen family. There are no western-style beds, but soft mattresses are provided. You will be served Thai and Western cuisine daily (with vegetarian options); tea & coffee made with treated water is also provided. What is provided in this package? Meals outside the project are not included, but are very cheap at the current exchange rates. Some volunteers have noted that there isn’t enough bedding to keep warm at night, so bringing a personal blanket could be helpful as well. If you want a comfortable pillow, bring that too. Thailand requires cash on hand of at least $300 (US) upon entry, although this is not always enforced. A visa is not normally necessary if you are a US or European citizen and your stay in Thailand is less than 30 days. No compulsory inoculations are required, although it is recommended that you check with your doctor to make sure your standard vaccinations (polio, typhoid and hepatitis A/B) are up to date. This is a tribal area and the villagers have a strict moral code. In the village all forms of alcohol & stimulants are forbidden. No sleeveless tops or short pants may be worn during stay at the village as volunteers must respect the modesty of the community. Bring t-shirts or long-sleeve shirts, and pants or a long skirt. I’m going to reiterate bringing warm clothes, and perhaps a blanket if you get cold easily. It’s been known to reach 50 degrees or less during the night at the project, although it will be hot during the day. If you're used to sleeping with a pillow, you should bring your own. There is no telephone or internet coverage in this area. In the event of weather or other conditions preventing access to the project area, volunteer placement will be changed to the elephant sanctuary instead. As volunteering takes place in a remote location, volunteers may not leave early. Not ready to book yet? Questions?